Crowley is given the task of delivering the baby to satanist nuns. Doing so with a heavy heart, as heavy as a demon heart can get, he didn't exactly expect to be running around wild, eleven years later, trying to find that same child. I mean, just how hard can it be to keep a track record of a child who shapes reality, and has a huge hell hound following him around? Well, apparently fairly hard if the child wasn't, in fact, introduced to Heaven or Hell concepts. Demon Crowley and Angel Aziraphael are the only souls under Heaven and above Hell who see the flaw in the whole "final war" plan. Either side winning means a great deal of losses. Not just because Heaven lacks good music, or Hell lacks decent entertainment other than soul torturing. It's mostly because humans are a fairly plentiful source of fun. They write books, they make nice cars... And all that - gone? I've been reading this book at day time, and at night time I'd go read Anne Rice's "Memnoch the Devil", and the two just fit so well together. There's the Devil telling his story, here's the Crowley trying to find Devil's son. 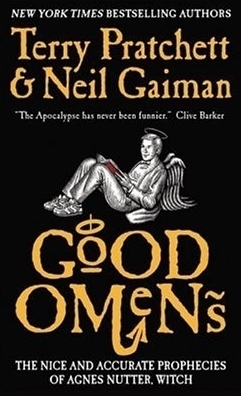 But taking all that away, since one book has nothing to do with the next, I did like Good Omens a plenty, and will give it whole 5 out of 5, for I can't see exactly where I could take anything away. Sign into Goodreads to see if any of your friends have read Good Omens.